Seems to be a winner is in everyone’s interest in any sports games, especially in the competitive atmosphere ones. Actually, I have realized since my childhood that sports games are not on the top list of my favorite activities because of its competitiveness. I’m not in favor of being a loser or a winner, neither of them since I believe that the gene of a winner is not in me. I am just an ordinary person who has an ordinary life. I don’t have any confidence to be a winner. In addition, I don’t like any competition at all till now. Not to blame anyone in this case. Currently, I am pushing myself to be an active member of badminton club in my company. We practice regularly every Tuesday in a badminton hall, only 5-10 minutes away from the office. From the badminton games, I learn a lot on how to cope with my problem of being a loser and put my self firmly to face the fact that I’m not a good player yet. Many session I’ve been through and always lost on those games. Then I chose to be a referee. From this position, I could see how a good player plays on the field. I learned a lot. Since then, I practiced their way of playing in badminton. Sometimes I won, sometimes I lost. But what I learn from badminton is not about winning or losing; it is about not quitting. 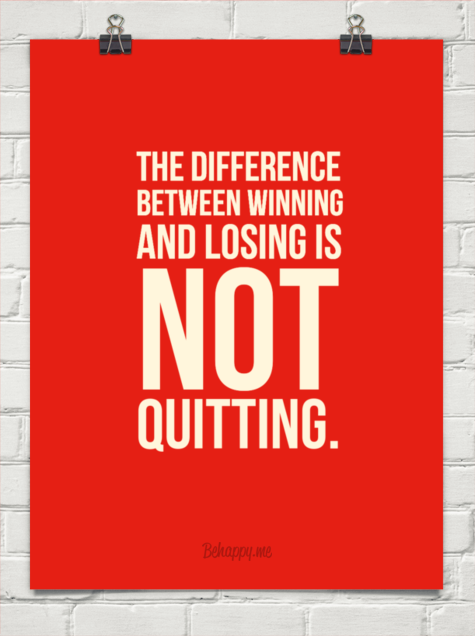 I believe in not quitting is the basic different between winning and losing. Consequently, I have to put more strength in continues learning process to be a better player, not to be a winner. In my humble opinion, being a winner is just a bonus of upgrading my skills in playing badminton. Even though I can’t be a winner, I just need to know that I’ve been a better player from days to days. When I’m contemplating of my point of view of the games, I’m looking back to my past. I’m feeling so lucky for having a chance to live my life even though not to the fullest yet. Fortunately, I could grab a chance to be top three of the best graduate from university, secure a rare opportunity to go overseas and have a privilege to be a teacher in a remote area for a year. In those three cases, I have never been thinking of competition is about winning or losing. It’s just about showing my best and believe in myself that I deserve those chances, not because I want to be a winner who’s going to beat others.